Everyone wants to do something special for the person they love. A beautiful way to surprise them on a special occasion would be to send black forest cake with mix rose Jaipur. A yummy cake along with roses is a great gift. 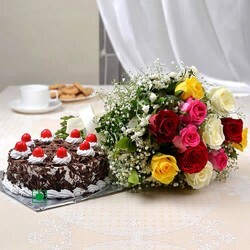 You can buy cake and the roses together from Gift Jaipur. When you order cake and roses combo you will have to pay much less that what you had to pay for them if you bought them separately. The cake delivery will be made within a few days of you completing the cake online order. The cake in the combo is made as an eggless cake.